Saturday morning I sent my sister a message to ask her if I can make dinner for her and her family. She was happy to say YES!!! I enjoy cooking for people and I enjoy trying new things. I got this awesome recipe from Kelly at No Thanks to Cake. I also made some dessert for them too and Grilled Caramelized Pineapple on top of ICE CREAM, so delicious. 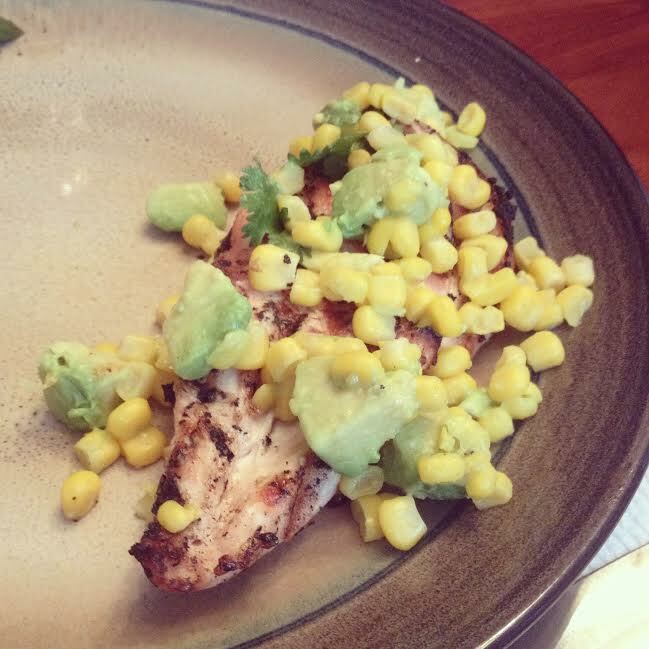 Grilled Lime Chicken with Avocado-Corn Salsa with some grilled asparagus. Combine the 2 Tbsp lime juice, 2 Tbsp of cilantro, 1/4 tsp of salt, and 1/8 tsp of pepper add to a ziplock bag and then add the chicken. Place the bag or you can use a bowl into the refrigerator for about 20 minutes. If you use a ziplock bag make sure you get all the air out. To make the salsa combine the corn and the avocado with the remaining 1 1/2 Tbsp of lime juice and 2 Tbsp of cilantro, 1/4 tsp salt, and 1/8 tsp of pepper into a bowl. You can use corn in the can or fresh corn. I used Green Giant canned corn. I placed the salsa in the refrigerator until the chicken was cooked. After 20 minutes take the chicken out on the grill and cook 10 to 12 minutes. Once the chicken is finished place 1/4 cup of salsa on each chicken breast and Enjoy. 268 Calories for one Chicken Breast with 1/4 cup of Salsa. Dice the pineapple and place them in another bowl. Pour the batter all over the pineapples and place in the refrigerator for about 30 minutes. Place the caramelized pineapples on aluminium foil and grill for about 10 to 15 minutes. Then place the yummy pineapples on some ice cream.